After two miscarriages in a row, I got my rainbow baby. My older kids, my husband, and I all love her dearly. We dote on her and probably hover a little too much. She knows she is loved. However, sometimes I find myself wondering about the ones that did not get to be born. I wonder if they would have blond hair. I wonder if they would have slept through the night or would they have been like Sweet Pea and not slept at all. Would they be outgoing or would they be shy? What would their favorite lovey be? What would be their favorite food? Would they like frozen waffles like all their siblings? I would like to think so. This month is Pregnancy and Infant Loss Awareness Month. I still sometimes feel like there is an empty spot where they should be. However, I want them to know they are not forgotten. They will forever be loved by all of us. While we will never get to see what kind of personalities they would have had or what they would have grown up to be, we will always remember them and hope that we will someday meet in Heaven. We focus on what we have, like each other and try not to take one another for granted. They will forever be in our hearts. 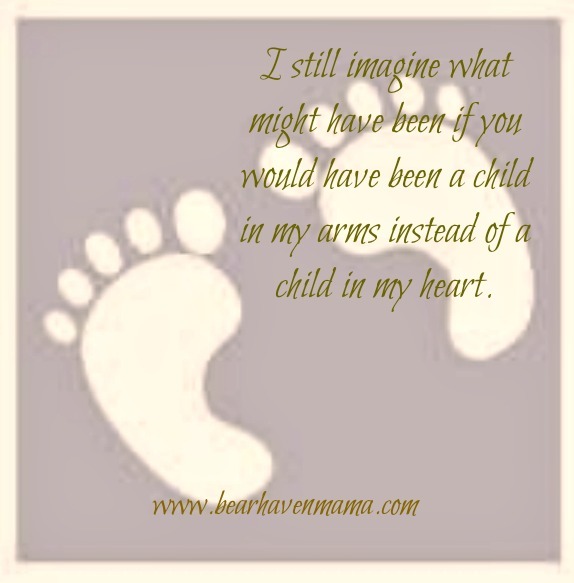 If you have suffered an infant loss or miscarriage. Please know you are not alone. Please know that while it is hard and while some people may not understand or support you, it is okay to grieve. It is okay to feel however you need to feel and for however long you need to feel it. This is not something that is often talked about. In fact, I didn’t know how many of my friends had miscarriages until I started talking about mine. That is why I have talked about mine so much. I want people to know that it is okay to grieve for the child you didn’t get to know. It is okay to miss that child and wonder what might have been. If you would like to share your story, please feel free to do so in the comments below. I suffered 3 miscarriages before my two boys came along. And yes, I sometimes do wonder how they would have been like.